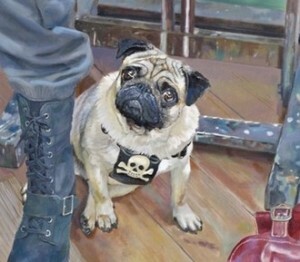 Dogs in pictures can be very engaging but, in the hands of an expert artist, their use goes far beyond mere representation. In this and the next post, I’ll discuss complex images in which a dog plays a key role. Our canine companions can form all kinds of picture-worthy shapes, suggest directional movement and add focus and structure to a painting. But it is their complex emotional bond with us humans that makes them particularly valuable within picture compositions. Anyone who has leafed through a book of dog breeds will be familiar with the huge variations in canine shape due to conformation. Over the years, types of dog have been specifically bred not just for function but also for the visual impact of their appearance. Consider, for example, the “…graceful, aristocratic, dignified and elegant” Borzoi, or the “…broad, powerful and compact” Bulldog. When including a dog in a painting, we must also remember that the posture of the animal chosen by the artist will completely alter the nature of its overall shape or silhouette. A browse through David Hockney’s sketches of his own Dachsunds, in each case painted from life, shows the postural variation that he observed. 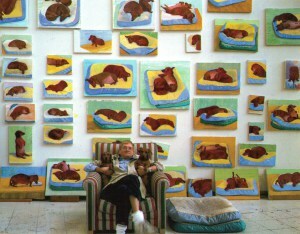 Some of Hockney’s rapid dog paintings are shown above. Considering dog images for a moment as flat, abstract shapes, you’ll see that almost all of these are curve-edged. The straight-backed dog sitting up on his haunches is an exception. Which of these dogs (or pairs of dogs) has a simple, smoothly-curved outline, and which has a more intricate, playful, notched shape? 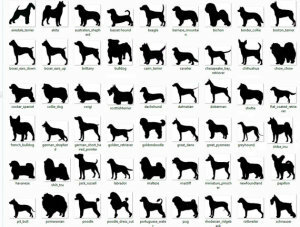 Do any of these dog shapes suggest movement to you, perhaps by making your eye flow across the picture? Does one or more of these images make your eye stop or pause on the page like a written punctuation mark? Dog posed with a human sitter: could the dog offer clues to the sitter’s personality? People often speak light-heartedly of the similarity between a dog and its owner. Well, a recent study confirms that dog owners indeed tend to believe that their dog has the same personality traits as themselves. Furthermore, other people (or, at least, family members) tend to see a dog and its owner as being alike in personality. For more information about that study you may wish to follow this link. So, perhaps the viewer can glean interesting information about a sitter from their dog. To achieve this effect, the artist first needs to suggest a clear emotional bond between the person and the animal. In Courbet’s “Self portrait with Black Dog”, dog and owner are both portrayed as dark, rounded shapes against a bright background. 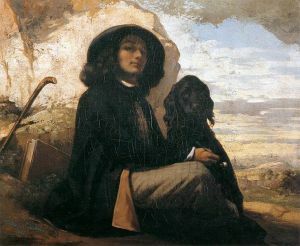 Part of Courbet’s face is illuminated, but his hat, cloak and long, dark hair create a black figure mass similar to that of the nearly-silhouetted dog. The shapes and dark tone of dog and owner are so similar that the viewer cannot resist looking from one to the other and back again repeatedly, and Courbet’s dark-sleeved arm creates a link between the two figures. This painting of Courbet was one of a series of self-portraits in which he portrayed himself in many guises and with different facial expressions. During this period, Courbet was striving to achieve artistic recognition but, out of many paintings, only this self-portrait was accepted by the judges for the Salon exhibition (in 1844). What impression does Courbet give of himself in this image? The lighting is arranged so that his eyes are mysteriously shaded, but he appears to be looking down his nose at those who are viewing or judging his work. Just like a modern-day selfie, this is the image-conscious pose of a young person who is trying to make their way forward in the world and probably tells us little about Courbet himself. The face of the dog is perhaps more telling. His or her trusting, appealing expression is not turned to the owner but is directed straight at us, the viewers. Though all sentimentality is avoided by clever use of lighting, the inclusion of this dog at last suggests a sensitive and, ironically, more “human” side to Courbet’s nature during this difficult stage of his career. On visiting the BP portrait exhibition in London this year, I very much enjoyed Tim Hall’s portrait of his wife, Henrietta. Standing in front of the painting, which I remember as virtually life-size, the dog at her feet struck me as incredibly well-observed. These broad-chested dog breeds put a lot of weight through their front legs just as portrayed here and some individuals do tend to sit with their hindquarters swivelled to one side just like this (whether due to stiffness or habit). This posture is so convincing that, as a vet and pet physiotherapist myself, I feel like reaching out into the picture to help relieve his heavily-loaded left front leg. A vertical line drawn up through the dog’s main weight-support, his left front leg, overlies the main vertical prop of the easel. Follow this line further vertically upwards and your eye is directly led to an image of René Redzepi, here being painted by Henrietta. Although the painting is entitled “Henrietta and Ollie”, it gives prominence to all three figures. There is a twist/rotation within Ollie’s body, so that the back legs are pointing in a different direction to the front legs. A similar angulation is seen over and again throughout the picture, subconsciously encouraging the viewer to keep looking around the image. An obvious example is the pair of red boots positioned at an angle to one another. Further pairs of objects echo this angulation. Consider the brushes splayed out in Henrietta’s hands, angles between paint tube and palette knife on the table top, or the prominent angle formed by the corner of that table top. 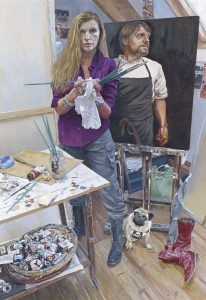 Though the painted artist (Henrietta) and her image of René Redzepi are gazing out in different directions, the weighty little dog forms a compositional link between them. He achieves this by physically leaning against her foot, while also forming a visual base of support for René’s portrait. Intelligently placed, the image of Ollie helps to bring the multiple elements of this picture together. Turcsán, B., Range, F., Virányi, Z., Miklósi, Á., & Kubinyi, E. (2012). Birds of a feather flock together? Perceived personality matching in owner–dog dyads. Applied Animal Behaviour Science, 140(3), 154-160.